This concept affords all employees the opportunity to clear through the clutter of managerial hierarchy and encourages collaboration and discussion. It’s simple, really: everyone on the staff is invited to provide feedback to their peers. Generally, the comments are thoughtful, constructive and designed to help you do your job better. Not only does it make for an open working culture, but also levels the playing field and helps employees rise to the occasion each and every day. After all, a rising tide lifts all boats. I admire this practice a lot but also recognize that feedback and criticism aren’t always easy to give or receive. So, how can we get better at it? Over the course of my life, I’ve expended a lot of energy trying to avoid conflict. It’s uncomfortable. Second only to my fear of heights, the thing that scares me the most is the first time that I have to offer critical feedback to a colleague or friend. There’s no way for me to know what kind of headspace a person is in, how they’ll take it or if I’m being clear enough. Perhaps it stems from being overly-sensitive, and a past history of taking every piece of criticism as a sign of personal failure (I’ve changed, thank goodness). 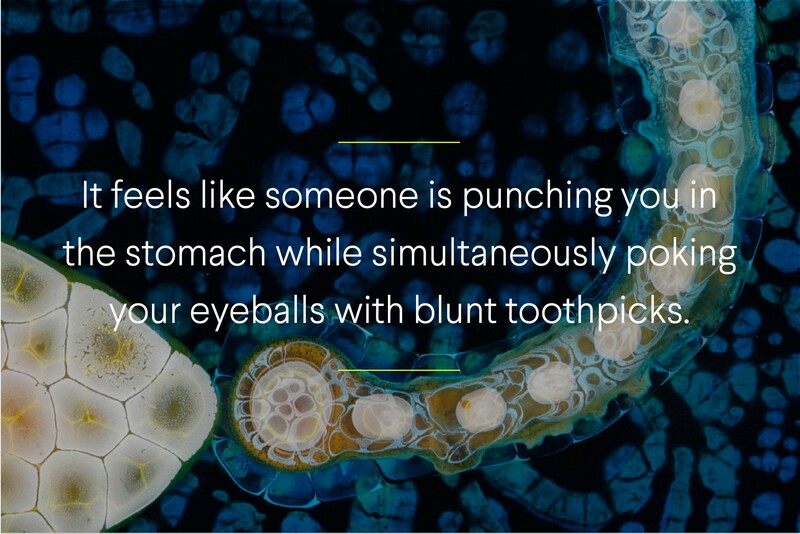 It feels like someone is punching you in the stomach while simultaneously poking your eyeballs with blunt toothpicks. I’m not sure if this is everyone’s reaction to providing feedback, but personally, I find it quite distressing. 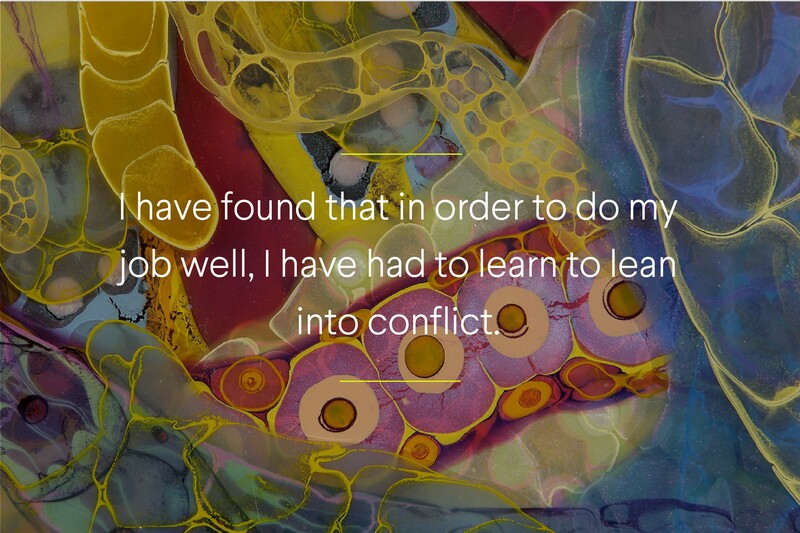 Unfortunately, I have found that in order to do my job well, I have had to learn to lean into conflict. My career is a series of critiques: between team meetings and client feedback, there’s not a whole lot of room for discomfort. Over time, I also realized that I rarely regretted engaging in these types of dialogues. If you think about it, some of the richest conversations that we have are the ones where divergent perspectives are presented. These discussions have the power to expand our horizons, elevate the quality of our work and strengthen the teams we work in. The truth is, when we engage in conversations that expose and reinforce our differences, the conflict is what pushes you harder and forces you to evolve your idea into something even better. 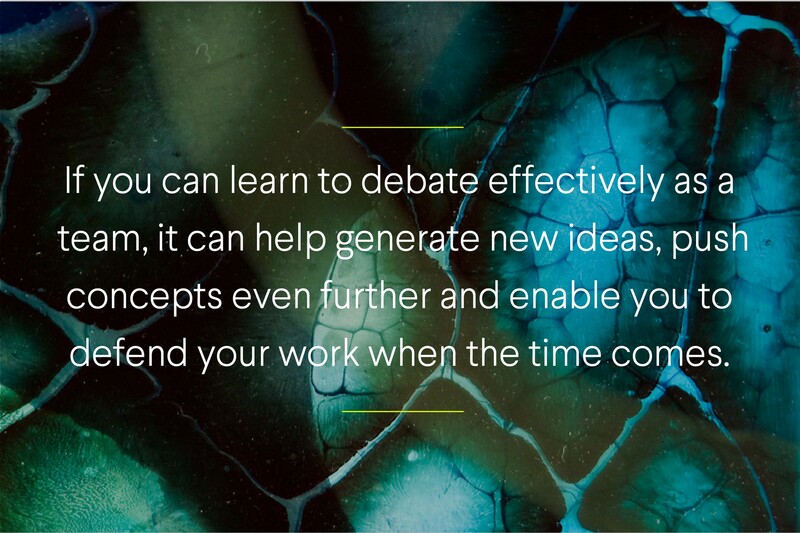 Additionally, if you can learn to debate effectively as a team, it can help generate new ideas, push concepts even further and help you defend your work when the time comes. So while the anticipation of conflict still makes an insecure and surprisingly introverted person like myself want to hide in my office’s supply closet, I have found that not only is strife necessary, but it can also be hugely liberating. A significant body of research now suggests that conflict among teams is actually really good, especially when that fighting is focused around creative ideas. If everyone on a team is always in alignment it can mean that ideas are stagnant, or that a team values cohesiveness over conflict. Either way, agreeing can sometimes stand in the way of producing outstanding creative work. There is, however, one important, golden rule before you embark on the path of most resistance: you want to know what it is you’re fighting for. You also want to make sure that it’s absolutely worth it. This is not about being contrarian, disagreeing for the sake of starting an argument or being a troll. Conflict is exhausting, so before you take the time to gather your arsenal and go into battle, you want to ensure that the scrapes and scars you’ll get along the way will yield the results and impact you desire. 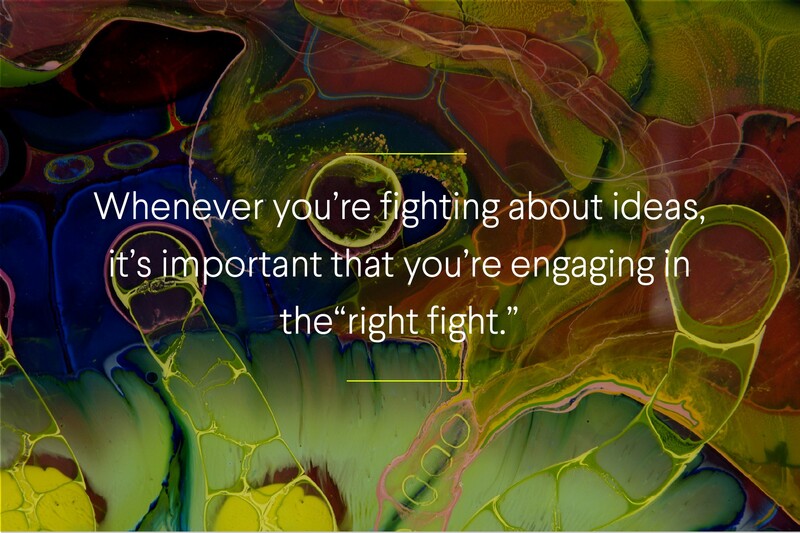 Whenever you’re fighting about ideas, it’s important that you’re engaging in the “right fight” — criticizing a person’s ideas or work, and not the person himself. This type of conflict is what researchers call “intellectual” conflict, and it must be done in an atmosphere of mutual respect. Also, for whatever it’s worth, I try to temper my feedback with something I think my peers are doing well. I don’t do this for the sake of being nice, but instead because I think there is always some inherent value in what is being presented, and it’s important to recognize that. When a project is being considered or developed, criticism and constructive conflict are vital to assessing the quality of your ideas. The old adage that there are “no bad ideas” may work during the idea generation phase, but won’t prove useful when it’s time to start evaluating the concepts to push them further. For the animators at Pixar, conflict and debate are a part of their morning routine. Every day, the teams gather first thing to review their work from the previous day. They examine each key frame, and, in turn, criticize nearly everything about it. No detail is too small to critique, and no one is prohibited from arguing against the work of someone else. Everything, from the angle of the lighting to the timing of certain sound effects is brought into question and discussed. At Pixar, they call this “shredding”, and though I imagine it must be draining, the process is vital to their ability to release quality work again and again. We work a lot like this at Dynamo, and it’s one of the aspects of my job that I find the most enriching. 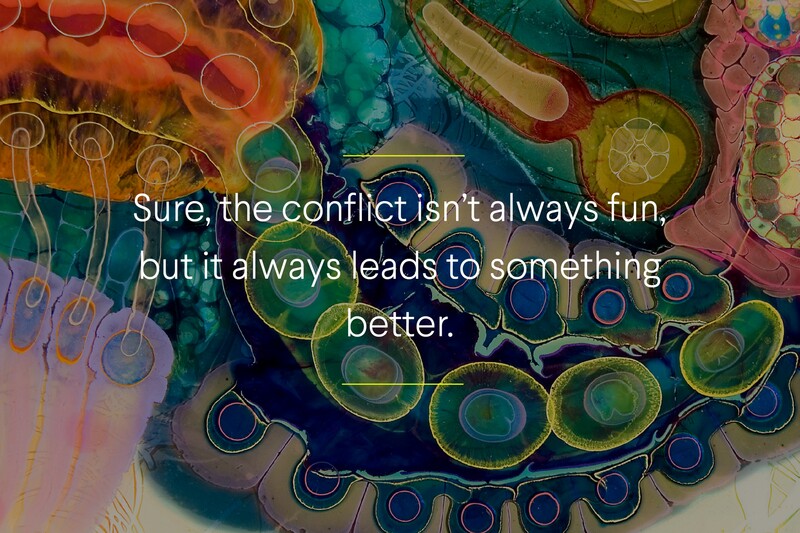 Sure, the conflict isn’t always fun, but it always leads to something better. We often take the time to sleep on our ideas and let them marinate. We aren’t too quick to make decisions, and we try to ensure that everyone’s voice is heard. I always feel that my colleagues are as respectful and constructive as the situation allows, but rarely at the expense of the work. Sometimes, this creative back-and-forth can be difficult (especially on a deadline), and it certainly presents challenges to the decision-making process, but I’m certain it yields results that the team can be proud of in the long term. The biggest thing that I have learned about dealing with conflict is that it’s fundamentally about a mindset. 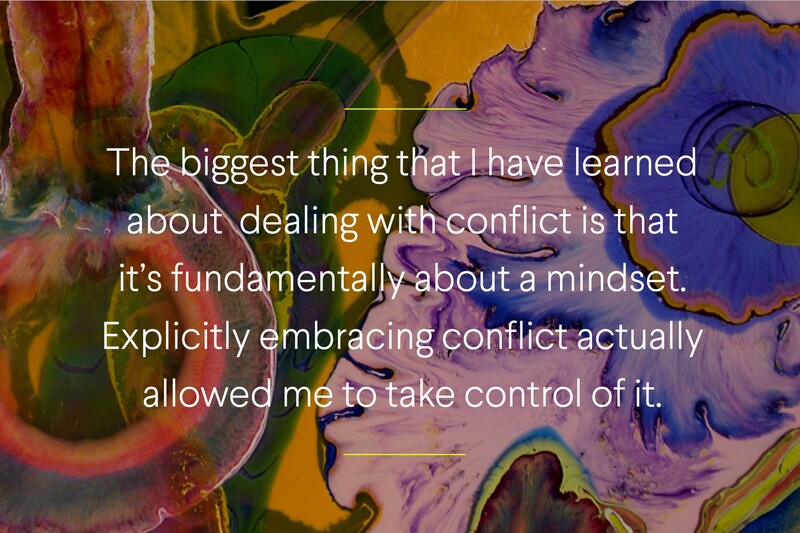 Explicitly embracing conflict actually allowed me to take control of it. Not only has it helped me develop a thicker skin, but it’s also made the work I produce better and allowed me to present work more confidently knowing that it has stood up to our rigorous internal standards. 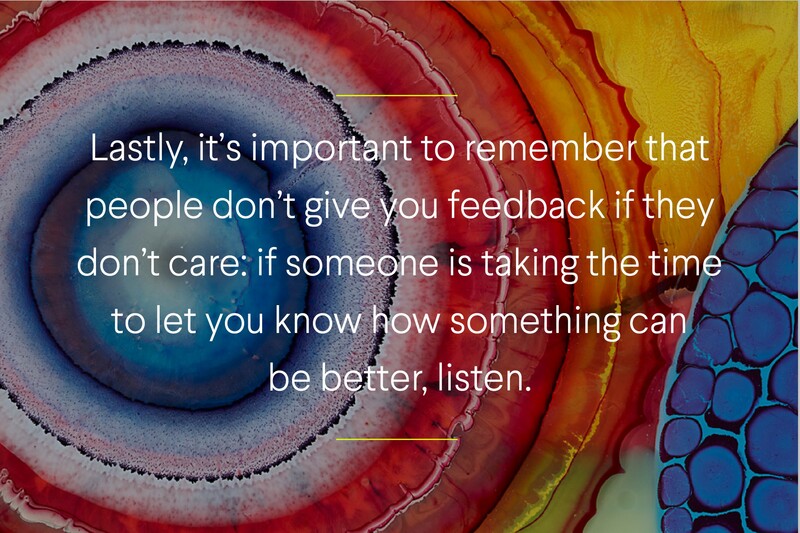 Lastly, it’s important to remember that people don’t give you feedback if they don’t care: if someone is taking the time to let you know how something can be better, listen. Your team, whether it be your peers, employees, colleagues or bosses, are there to help, guide support and elevate you and the work you produce. At the end of the day, I still find conflict is super scary. It’s uncomfortable. But what I have learned is that it’s one of the most effective tools at pushing forward, meaningful, creative work.